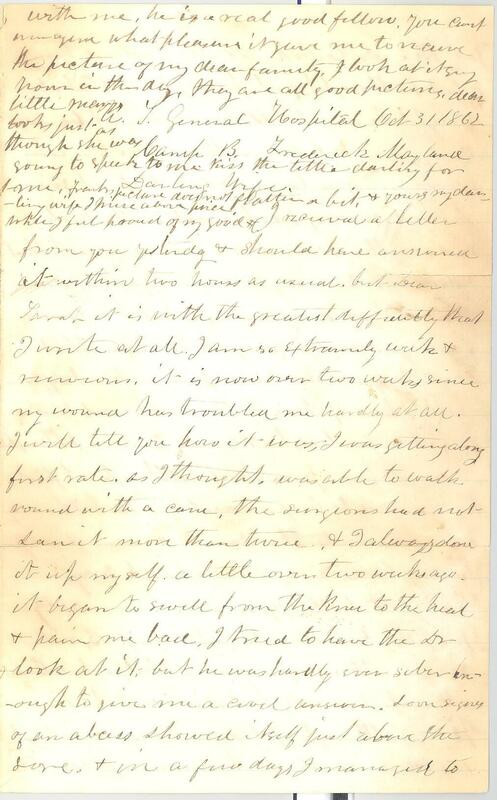 Item description: Letter, dated 31 October 1862, from Charles H. Little, Company K, 9th New Hampshire Volunteers, to his wife. 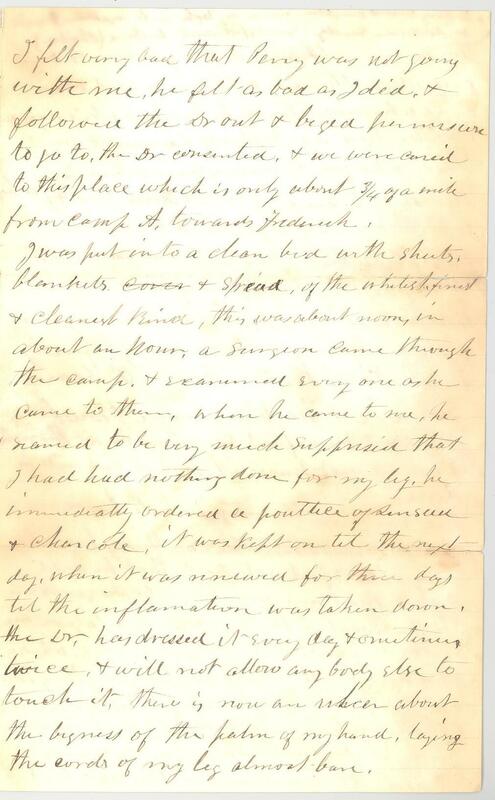 Little writes from a hospital in Frederick, Maryland, describing the treatment he has been receiving for a wound received at the Battle of Antietam. Item citation: From the Charles H. Little papers #4434-z, Southern Historical Collection, The Wilson Library, University of North Carolina at Chapel Hill. I received a letter from you yesterday & should have answered it within two hours as usual, but Dear Sarah it is with the greatest difficulty that I write at all. I am so extremely weak & nervous. it is now over two weeks since my wound has troubled me hardly at all. I will tell you how it was, I was getting along first rate. as I thought, was able to walk round with a cane, the surgeons had not [?] it more than twice, & I always done it up myself. a little over two weeks ago, it began to swell from the knee to the heel & pain me bad. I tried to have the Dr. look at it, but he was hardly ever sober enough to give me a [?] answer. Soon signs of an abcess showed itself just above the sore. & in a few days I managed to get the Dr. to look at it. I asked him what he thought of it. he replied that it might be an abcess, or it might be something else, but done nothing for it nor recommended to me what to do. it soon showed signs of breaking out on the back side of the wound, & I became so weak that I did not leave my bed for days. & O! Dear Sarah God only knows what I suffered for a few days, hoping all the time that something would [?] up to make it different. I had spoken to the Dr. several times to get a furlough, & every time as I thought it made [?] provoked, although at first he seamed to be favorable. 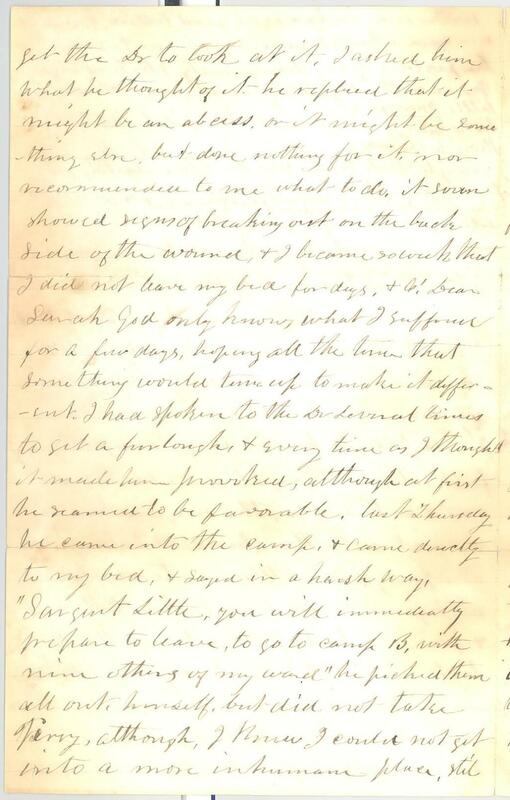 last Thursday he came into the camp, & came directly to my bed, & sayed in a harsh way, “Sargent Little, you will immediately prepare to leave, to go to camp B, with nine others of my ward.” he picked them all out himself, but did not take Terry, although, I knew I could not get into a more inhuman place, stil I felt very bad that Perry was not going with me, he felt as bad as I did, & followed the Dr. out & beged permision to go to. the Dr. consented, & we were carried to this place which is only about 3/4 of a mile from camp & towards Frederick. I was put into a clean bed with sheets, blankets, & spread, of the whitest finest & cleanest kind, this was about noon, in about an hour, a surgeon came through the camp, & examined every one as he came to them, when he came to me, he seamed to be very much supprised that I had had nothing done for my leg. he immediatly ordered a poultice of [?] charcole, it was kept on til the next day, when it was renewed for three days til the inflamation was taken down. the Dr. has dressed it every day & sometimes twice, & will not allow anybody else to touch it. there is now an ulcer about the bigness of the palm of my hand, laying the cords of my leg almost bare. My Surgeon although a young man, is a perfect gentleman, & I believe a good man & one who understands his business his name is Hanks, & is a Nephew of Leonard & Orin Fraly[?] who you know are ministers in New Hampshire. I asked him to day what was the cause of my wound being so bad, he replyed that I had not had proper care, & my system had got very low & weak, I knew that my appetite has been very poor, & I have had my nerves severely tried by the death of Brother [?]. O! 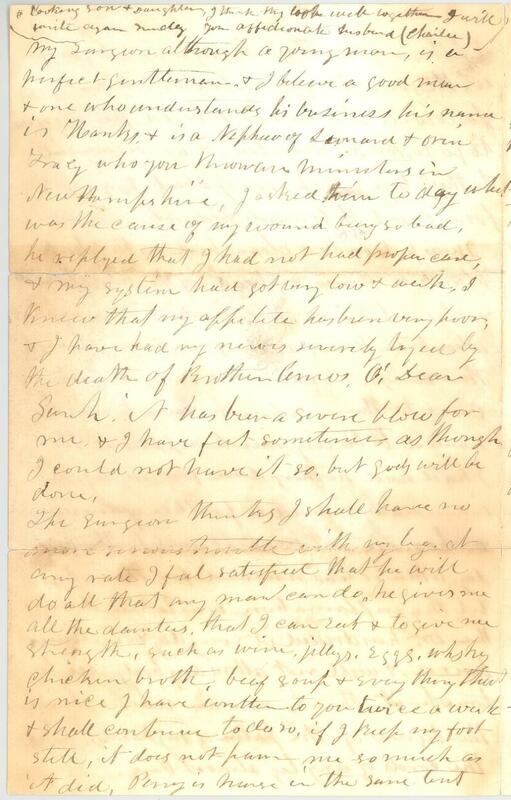 Dear Sarah, it has been a severe blow for me, & I have felt sometimes as though I could not have it so, but God’s will be done. The surgeon thinks I shall have no more serious trouble with my leg, at any rate I feel satisfied that he will do all that any man can do, he gives me all the [?] that I can eat & to give me strength, such as wine, jellys, eggs, whiskey, chicken broth, beef soup & every thing that is nice I have written to you twice a week & shall continue to do so, if I keep my foot still, it does not pain me so much as it did. Perry is nurse in the same tent with me. he is a real good fellow. you cant imagine what pleasure it gave me to receive the picture of my dear family. I look at it every hour in the day. they are all good pictures, dear little Mary[?] looks jus as though she was going to speak to me. kiss the little darling for me. Franks picture does not flatter a bit, & yours my darling wife I prize above price. This entry was posted in Southern Historical Collection and tagged 9th New Hampshire Volunteers, Battle of Antietam, Charles H. Little, Civil War medicine, Frederick, hospitals, Maryland, Maryland Campaign, New Hampshire, wounded soldiers. Bookmark the permalink.